Septoria leaf spot is caused by the fungus Septoria steviae. Septoria steviae has been reported on stevia in Japan, Canada, and the United States. At this time stevia is the only known host for Septoria steviae. Symptoms of Septoria steviae begin as small necrotic lesions at the base of the plant that gradually move upward in the canopy under favorable environmental conditions (Figure 1). As the season progresses, lesions coalesce leading to necrosis of entire leaves and eventual defoliation of the canopy (Figure 2). 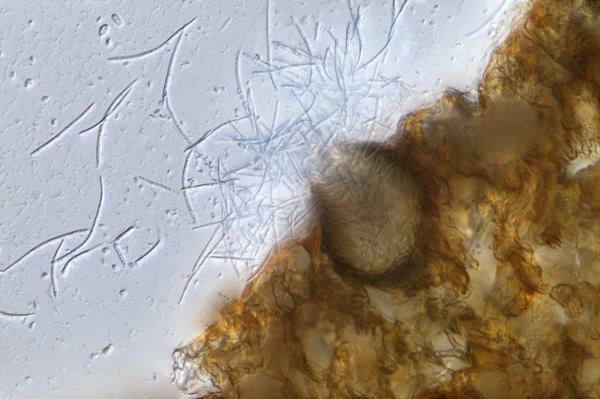 Within the lesions, S. steviae forms structures known as pycnidia that house asexual spores called conidia (Figure 3). Figure 1. Septoria leaf spot lesions at the base of stevia plants. Figure 2. Stevia plant totally defoliated due to Septoria leaf spot. Figure 3. Septoria steviae pycnidium embedded in leaf tissue releasing asexual conidia that can infect surrounding plant material. Septoria steviae infection can begin in greenhouse production, which results in the introduction of inoculum to the field (Figure 4). When stevia is grown as a perennial, inoculum is able to overwinter in plant debris and re-infect stevia plants as new stems emerge the following season (Figure 5). As lesions are formed, pycnidia release conidia that can be spread through rain splash throughout the season allowing the pathogen to move up the canopy (Figure 3). Disease spreads most rapidly in periods of high rain fall with cool night temperatures, typical of NC environmental conditions in September and October. Figure 4. Stevia seedlings that were infected by Septoria steviae in the greenhouse and planted in the field. Figure 5. Stevia stems emerging in a second year plant with symptoms of Septoria leaf spot. Resistant germplasm is not commercially available at this time. Sanitation in greenhouse production to reduce inoculum entering new fields is the best way to limit the spread of Septoria leaf spot at this time. Field research has shown that harvesting in September, before environmental conditions become highly conducive for disease progression, can result in higher yields than October harvests. 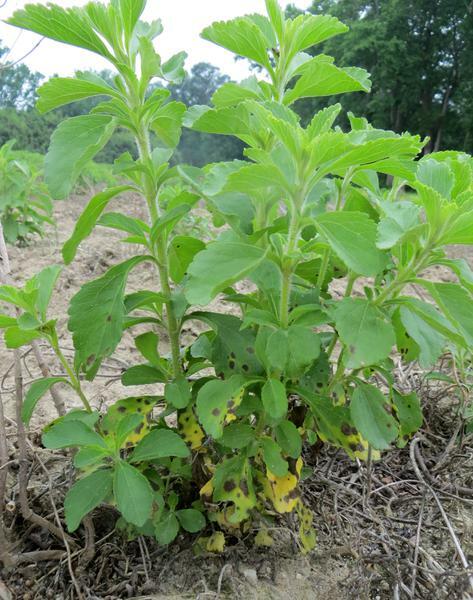 Stevia is a new crop and does not have any products labeled for management of Septoria leaf spot at this time. Efficacy field trials have been conducted to assist in establishing labels for S. steviae control in stevia production. Ishiba C, Tani T, Yokoyama T. 1982. Leaf spot disease of stevia caused by Septoria steviae. Annals of the Phytopathological Society of Japan. 48:34-43. Koehler A.M. and Shew H.D. 2018. Field efficacy and baseline sensitivities of fungicides used for the management of Septoria leaf spot of stevia. Crop Protection. 109:95-101. Koehler A.M. and Shew H.D. Evaluation of Seranade Opti and Kocide 3000 for control of Septoria leaf spot on stevia in North Carolina, 2016. Plant Disease Management Reports. Lovering N, Reeleder R. 1996. First report of Septoria steviae on stevia (Stevia rebaudiana) in North America. Plant Dis. 80:959. Reeleder, R. 1999. Septoria leaf spot of Stevia rebaudiana in Canada and methods for screening for resistance. Journal of Phytopathology. 147:605—613.